37 yesterday. Taking stock. Many thoughts. Very blessed. No time to blog. Maybe soon. So, I’ve been very slow to get sucked in to facebook/myspace. I’ve had accounts for a long time, but both always seem to frustrate me. Myspace is just so ugly and disgusting with all the adds that I hate even looking at it. However, I finally got sucked into facebook a little bit. It still frustrates me and I still can’t figure out how to do different things when I want to do them. But, I’ve reconnected with some friends that I’ve not talked to in years, so that’s fun. Anyway, this post is mostly it see if it will show up on facebook. Otherwise, facebook is still torturing me. I went to see The Clone Wars on opening day. Yes, it was an animated cartoon. Yes, I’ve seen better CGI animation. Yes, it was actually 3 1/2 hour episodes of the coming animated series smooshed together to make one movie with a bit roller-coastery plot line. Yes, I’ve heard infinitely better dialog in numerous other movies. But, do you know what else it had? It had blasters. It had Stormtroopers. It had robots. It had Jedi Knights. It had weird alien creatures. It had space fighters battling in space. It had Jedi Knights using the Force to help them fight the bad guys. It had Yoda. It had light sabers. When I was 6 years old and went to see Star Wars for the first time, do you think I cared about the dialog? Or the acting? Or the directing? Or the cinematography? No. Do you know what made me fall in love with Star Wars? But, I’m so sick of critics/reviewers saying that they’re “done with Star Wars”. “Lucas has finally killed their love for the Star Wars”. Fine. Don’t we all wish we were so smart. It’s too bad that Lucas didn’t make additional movies for the 30+ year old crowd with snappy scripts and sophisticated suspense and drama. In this instance, I prefer to check my own ample cynicism at the door and let Star Wars continue to take me back to a long time ago to a galaxy far far away when I was between the ages of 6 & 12 and all I wanted for Christmas was a real live light saber. Or more action figures. I’m pretty sure that’s how the current 6-12 year olds see it. A couple of months ago I linked to this opinion piece by Charlie Peacock which contained his predictions about the future of Christian Music. I just found this list of 4 Q&A with CP about the response he’s had to the piece. I didn’t really write anything before and don’t think that I need to now. I read CP’s book, Crossroads, when it came out 10 years ago and thought he was right on track then and think he’s still on track. If you care about such things, you might check it out. It’s over. My first summer break is over. Monday morning I will need to drag myself out of bed at 6:30am to quickly shower and dress and hit the road by 7am. Just like when I was a kid, I’m kind of excited and sad all at the same time. It will be nice to get into a new routine, get to know new students. Stay busy. Time speeds up. At the same time, I really enjoy doing next to nothing. I love getting to get Ivy up in the morning. I love getting to play with her and get her breakfast and do things whenever I want. I’m going to miss her a lot during the day. I am excited about teaching Social Studies. I am excited that I’ll be teaching one class of 8th grade Math where I’ll get to be with some students that I’ve already had. I am excited about my new administration who have been friendly, helpful and empowering thus far. I’m excited that I think I’m going to be getting some good feedback and suggestions about how I can teach better. For my last official day of summer break, I went to see Clone Wars. I thought it was good. I think it hit the tone about right. Maybe even better than the new movies. I’ll miss getting to go to movies in the afternoons on a weekday. But, I’m going to miss spending all day with my girls. If I ever hear of anybody coming even close to traveling through SE Colorado, you’ll see me freak out and tell them that they have to find and experience Bishop’s Castle. This just happened a couple of weeks ago when I was visiting with a fri end who was getting ready to leave on vacation. 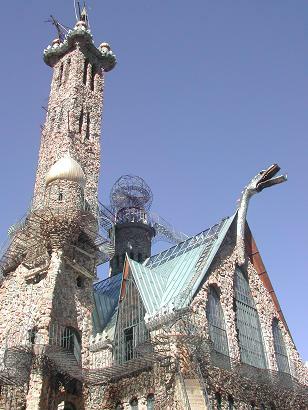 Now, it’s painfully obvious that Jim Bishop, the creator of this castle, is totally crazy. He’s been building this castle by himself, by hand, in his free time on nights and weekends since 1969. Crazy, right? Not necessarily in a bad way, just really crazy. Well, my friend went and took his family and some other friends. Jim Bishop was out there. This is not rare, he was there the first time I saw the castle with my sister. They talked a little. crazy talk. But harmless. Unfortunately, my friend said that while he was there and climbing to the top of one of the towers, he heard this yelling and screaming and didn’t know what was up. Come to find out that somebody from my friend’s group said something that set mr. bishop off. The topic of this volume-turned-to-11 ranting was blatantly racist. So, crazy and racist. My friend and I talked about how disappointing it is to find out that whatever is in this guy to take on such a magnificent and whimsical project would be driven by hate. This makes me sad, because I’ll still probably tell people that they need to seek out the castle, I’ll have to include a disclaimer about its creator.